← Cafe Helios in Downtown Raleigh ~ Great Coffee and Good Times! Wine 101 ~ Going For The Gold At The Beer Olympics! Last night my neighbor and I made the short trip over to the “Beer Olympics” over at my favorite wine store, Wine 101 in Wake Forest. As I described in an earlier post, the event was held in honor of the lighting of the olympic torch kicking off the 2010 winter olympics in Vancouver. The field of competition consisted of a grand total of 30 different beers from six different categories (Hefeweizen, Lagers, Belgians, IPAs, Strong IPAs, and Stouts). Joe, the owner of Wine 101, and his right hand man Jason poured 2 ounce tastes of each bear from unmarked half-gallon growlers. The honorable “ tasting judges” (myself and the 50 other people there) would then score each beer in this blind taste test on a scale of 1-10. At the end of the night the scores were to be tallied up and gold, silver, and bronze medals would be awarded in each category. Although I didn’t plan on it, amazingly my friend and I made it through all 30 beers! This was in large part thanks to the dedicated staff at wine 101 who were working very hard to make sure everyone in the large crowd that came to the event had the opportunity to taste every beer. They were also incredibly consistent with their 2 oz. pours which went a long way to make sure you didn’t over do it and wouldn’t get worn out before making it through the catalogue of beers. As we worked our way through the many beers to taste I found that I was a big fan of the Hefeweizen and the Strong IPA’s but was not crazy about the Lagers and regular IPAs. The Jury is still out for me on the Stouts. I don’t think my palate is mature or fascinated enough to recognize a quality stout at this point! That is what year’s of drinking Coor’s Light and Corona will do to you I guess! The “official” medal scoring is still being tallied and should be posted to their website soon, but in the meantime I did hear that one of the Hefeweizen I liked was the locally brewed Shotgun Betty from Lone Rider Brewery. I recently had this beer on a visit to the Rialto Theater in downtown Raleigh and think a visit to the brewery is in my future. My friend and I met some very friendly people throughout the evening as we shared our critiques of each brew and debated which beer we liked best. As always, whether you’re looking for a bottle of wine for dinner, or just attending one of their wine or beer tasting events Wine 101 is at the top of my list of places to check out. 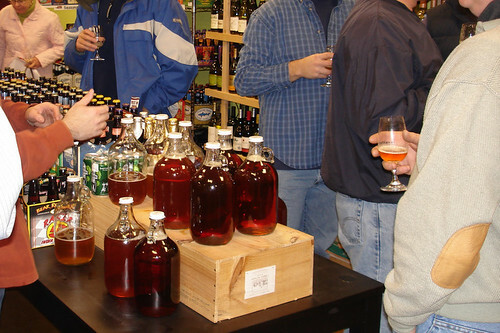 It is not only a great wine shop (which sells great beers too), but Joe and his staff are so friendly and helpful which gives the shop a real social atmosphere with a “neighborhood store” vibe making it a great place to visit to get out and meet new people. For more information about Wine 101 and future events check you can sign up for teir newsletter on their website or follow Joe on twitter.